A once wealthy and cocksure dandy and socialite, our founder, Oscar “Trip” Goodall III spent the better part of his youth exploring the seven seas in the lap of luxury aboard many of the worlds finest and most powerful steamliners. Carousing and absconding, Trip lived and loved with vigor, earning himself a reputation among the elite as someone who could mix an exotic cocktail, spin a tall tale, and fleece you thoroughly and completely at cribbage. During an extended stay in Morocco, Trip met and fell in love with Josette, a stunning but beguiling French bohemian. Escaping the strict expectations of her family and the doom of a conventional life, she was able to out-drink, out-fight, and out-wit anyone she came across. Together the two of them slipped from port to port finding jazz, artists, poets and revolutionaries, anyone who wanted to be free and live life to the fullest. 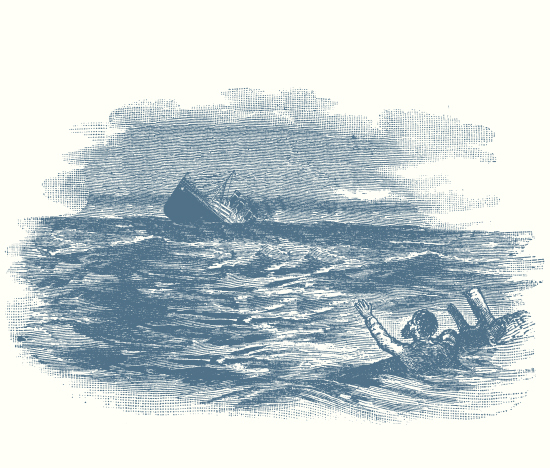 On a beautiful and otherwise uneventful day in the South Pacific, their ship, the Duchess of Calgaric, sunk for unknown reasons with a shocking and unheard of quickness. Trip, despite his best efforts to save Josette, was the sole survivor of the disaster. He surely would have perished from exposure, were it not for the strange friendship of a lone Albatross who brought him fish to eat and shielded him from the sun with its massive wings. Adrift for 23 days, he at long last washed ashore a small tropical island. There he learned to forage and scrape together a serviceable, if not homey, shelter, passing the time chatting with his reincarnated albatross love, Josette. Together they dreamed of their favorite delicacies and libations, and of the absurdity of luxuries lost but not missed. Over time he came to love his simple life, and he shed the composure and inhibitions society had once imposed. One morning Josette flew off over the water with unusual intention, not returning to Trip’s familiar calls and vanishing over the horizon. For three straight days, Trip stared over the edge of the water at the spot where Josette had disappeared, waiting for her to return. At sunrise on the fourth day, a gigantic steamliner came barreling towards the island with the clear purpose of rescuing our happily forgotten founder. Since found, Trip longs to be lost. Forever restless, the once jovial and raucous philander now quietly and piously tacks a wandering course around the globe, searching the secret alcoves he once shared with his beloved. Inexplicably altered by his island exile, he revels in obscurity and becomes an intriguing, but eccentric recluse. Considered by some to be a magnetic savant, he is equally regarded as a disturbed vagrant. Unnaturally uninhibited and seemingly wild, his disregard for convention is terrifying to some but greatly admired by others. Obsessed, our founder uses his great fortune to build a chain of luxury hotels around the world. Seemingly out of contempt for his wealth he spares no expense catering to his former peers’ exquisite taste for decadence. Each location an eclectic combination of primitive island ingenuity and posh old-world luxury. The hotels serve as a global network of outposts for his continued and fruitless search. While servicing the elite, the hotels are also safe-havens for the ilk of Josette, becoming favorite enclaves of artists, intellectuals, and the fringe of society. At every location, a single cot in an unadorned basement room is kept reserved for the eccentric founder. Trip would travel with only two pieces of luggage; a rugged sea chest containing a number of freshly pressed duplicates of his self-imposed uniform; and an alligator skin bag that carried a small collection of exotic spices; a bone flute; his assortment of homemade salves and tinctures; a straight razor and a bundle of notebooks with an ever-growing number of handwritten recipes from which he would have every meal exactingly prepared by a private and silent chef. After over 30 years of searching, Oscar Goodall III at last accepts the loss of his beloved Josette. Almost at once the seemingly ageless proprietor begins to shrivel and within weeks he quietly passes into the night. In his last will and testament he leaves everything to his long lost Albatross, Josette. The staff, rudderless and unable to continue operations, abandon the hotels completely, looting anything of value. The once majestic empire of hotels are left as fallow shells, either crumbling to the ground or falling into the hands of floppers, slumlords, kingpins or lepers, their former glory utterly forgotten. Today we sit in the Cafe and Lounge of Seattle’s own Long Lost but Faithfully Restored Hotel Albatross, the remnants of which were discovered while peeling away the layers of over 40 years worth of filth and decay from a crumbling cantina. Bits and corners of the once grand hotel have been resurrected, and pieced together, not unlike an archaeological site. Still below is the unadorned room with the single cot, and inside the alligator skin bag were discovered the notebooks of Trip’s exacting recipes, which we enjoy here today.